Congratulations to current VCFA MFA in Film faculty member Mike Day whose film, THE ISLANDS AND THE WHALES, has been awarded a 2017 Peabody Award! To read more about the film, and to watch some great interviews with Day, visit the PBS POV site. The 77th Annual Peabody Awards Ceremony will take place on May 19th, 2018 in New York. 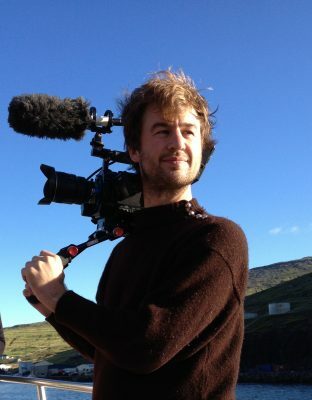 Mike Day is a Scottish director and cinematographer. Formerly a lawyer, Day founded Intrepid Cinema in 2009 before heading out into the North Atlantic on a boat to make his first documentary, THE GUGA HUNTERS OF NESS, commissioned by the BBC. While at sea filming, Day met a group of Faroese sailors, which lead to the creations of his next film, THE ISLANDS AND THE WHALES. The film went on to win multiple awards and picked up the 60th CINE Golden Eagle Award, a BAFTA nomination, and a Peabody Award (2017). Day was listed as one of “10 Filmmakers to Watch” by Filmmaker Magazine, with films funded and supported by the Sundance Institute, San Francisco Film Society, The Filmmaker Fund, Creative Scotland, and Danish Film Institute and many others his films have screened with broadcasters worldwide including the BBC, ARTE, ZDF, NRK, DR and POV on PBS with theatrical releases in the US, UK and around Europe and Australia.